The Fairfax County Board of Supervisors will discuss a proposed February public hearing on the funding plan for Reston transportation projects. County Executive Edward Long has recommended the board hold a public hearing on the plan Tuesday, Feb. 28 at 4:30 p.m.; the board will vote at its meeting next week (Tuesday, Jan. 24) whether to do so. The Board of Supervisors (“the Board”) authorized the Reston Master Plan Special Study on May 18, 2009, and directed staff to initiate Phase I of the study, which is a review of Comprehensive Plan recommendations pertaining to the areas around the three planned Reston Metrorail stations: Reston Town Center Station, Wiehle-Reston East Station and the Herndon Station (Reston Transit Station Areas). In Fall 2009, a community Task Force of 41 members (25 primary and 16 alternate) was appointed for the Phase I effort by the Board of Supervisors (Reston Master Plan Special Study (Phase I)), which included representatives of Reston resident groups, owners of commercial property in the study area and other interested members of the community. Working with staff, the Task Force was charged with evaluating existing Comprehensive Plan recommendations and identifying changes to guide future transit-oriented development (TOD) in the vicinity of the three Reston stations. The Task Force and several sub-committees met regularly from 2010 through 2013 to consider approaches to further TOD development at the stations. Subsequently, the Task Force worked with staff to finalize their recommendations which were finalized at their meeting on October 29, 2013. On February 11, 2014, the Board of Supervisors adopted an amendment to the Comprehensive Plan for Reston, based on the results of the Reston Master Plan Special Study (Phase I). 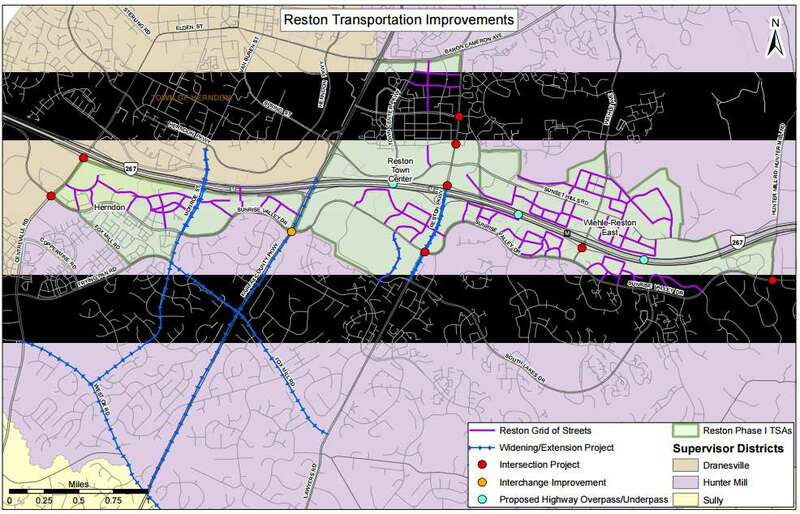 When the Board adopted the Comprehensive Plan amendment for Phase I of Reston, it also adopted a follow-on motion to address funding of associated transportation projects. The funding follow-on motion requested that staff and the Planning Commission develop an inclusive process to prepare a funding plan for the transportation improvements recommended in the Reston Master Plan and return to the Board with its recommendations at an appropriate time. Staff not only recognizes the significance of the Reston Transit Station Areas (Reston TSAs), but also recognizes that improvements in the Reston TSAs must be balanced with needs in other areas of the County. Staff has taken this need for balance into consideration in staff’s recommendations to the Board. The project is expected to cost in excess of $2.2 billion. A community meeting to discuss the plan was held Thursday evening. a) Allocate public funds through future board actions such as endorsing a funding plan, a future transportation priorities plans, or other actions of the board. b) Create a Reston Transportation Road Fund over the Reston TSAs with the following rates that is intended to collect approximately $211 million (as adjusted for inflation). c) Establish a Transportation Service District over the Reston TSAs that is intended to collect approximately $139 million (as adjusted for inflation). d) Adjust the Reston Transportation Road Fund rates and Transportation Service District rates in a manner that is consistent with the Code of Virginia, the County’s budget cycle requirements, and cash flow need. f) Evaluate the Reston Transportation Funding Plan on a periodic basis to ensure that the funding contribution levels are sufficient, the funding available is being allocated effectively, and projects are proceeding on schedule. g) Establish a Reston Transportation Service District Advisory Board to provide input on the annual tax rate for the proposed Service District, the transportation project priorities for those projects funded all or in part by the tax district, and project implementation schedules. In addition, the Reston Transportation Service District Advisory Board may also provide input on the annual adjustment of Road Fund rates related to the Grid Network and Intersection Improvements. h) The Service District and Road Fund will both have sunset provisions to ensure that once the projects identified in the Reston Phase I Comprehensive Plan Amendment are completed, any debt has been paid in full, and any other obligations incurred by the Service District or Road Fund have been satisfied, the Service District and the Road Fund will terminate. Staff will establish the sunset provisions accordingly for each fund and as allowed by state code. Specific public revenue source and associated revenues may vary over the life of the plan, according to information provided by the board, but public revenues from existing sources are projected to be available to fund the total amount of improvements. Private revenue sources are expected to include $716 million in in-kind contributions, $211 million from the Reston TSA Road Fund and $138 million in service district contributions. 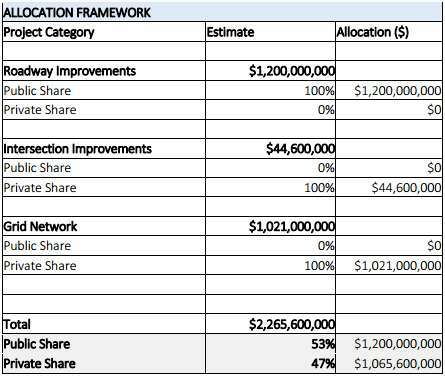 The proposed Reston Transportation Funding Plan addresses the $2.27 billion (in 2016 dollars) need for infrastructure improvements to support the recommendations in the Reston Phase I Comprehensive Plan Amendment. The proposed plan allocates roughly $1.2 billion of the improvements over 40 years from public funds – federal, state, local, and regional funds that are anticipated for countywide transportation projects. 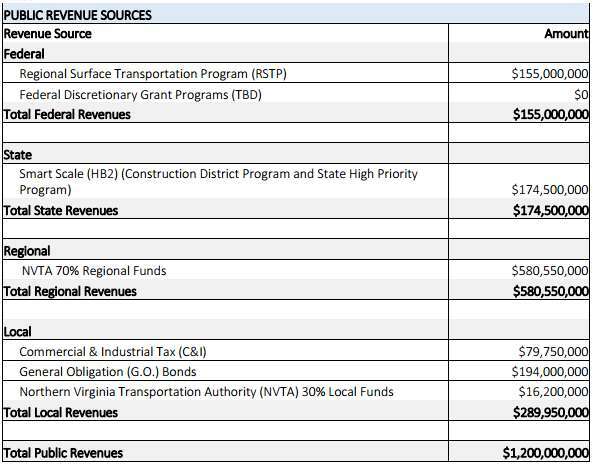 Approximately $1.07 billion of the improvement costs will be raised from private funds – sources of revenue that are generated within the Reston TSAs and used exclusively for transportation projects in the Reston TSAs; this will require creation of a service district fund and County road fund project for management of revenues. It is anticipated that a fund for the service district will be created in FY 2018, and a new project will be created in Fund 30040 (Contributed Roadway Improvements) for the management of these Reston road fund contributions. The next Fairfax County Board of Supervisors meeting is scheduled for Tuesday, Jan. 24 at 9:30 a.m. at the Fairfax County Government Center (12000 Government Center Parkway, Fairfax).